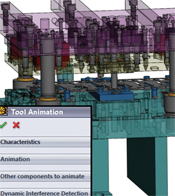 Design, New Berlin, WI, provides Logopress3 3D die-design software (SolidWorks Gold Certified) as well as stand-alone Forming Technologies Inc. forming-simulation, flat-blank prediction and quoting software. Logopress3 features automatic 2D drawing creation, tool animation and dynamic interference detection, and includes a vast intelligent component library of catalog components in both inch and metric sizes. The firm also produces a fast, economical finite-element-analysis software package called Logopress3 Blank, which requires no formal training. In addition to the blank, it analyzes stress, strain and thinning. See also: Accurate Die Design Software, Inc.